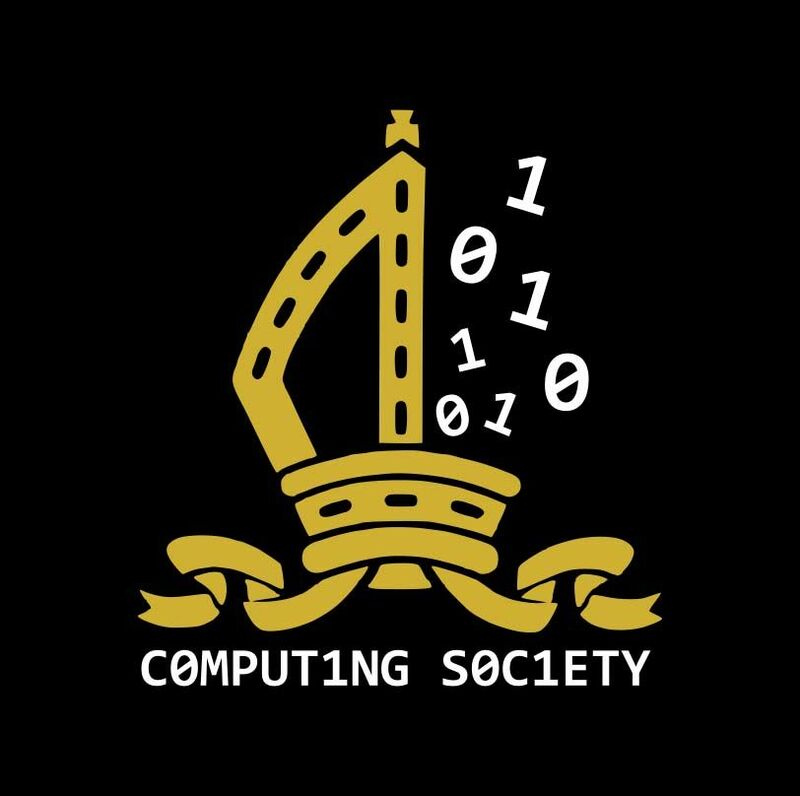 The new student-led Computing Society was set up earlier in September 2018 and all students in Years 12-13 are welcome to attend; we meet in Room 28 Tuesdays as per the school's Daily Notices. Computer Science is a 21st Century skill that enables students to be creators rather than just consumers of technology and the aim of the Society is to help and support students who have a passion for computing and who are keen to discuss and debate any aspect of the subject that interests them. Whether it be coding and programming, the dawn of artificial intelligence (AI) or the latest technological developments in this fast changing and moving industry, we want to provide an atmosphere in which students can share their proficiency with other like-minded students. Whereas some of us are hoping to study Computer Science at university, others come along as there are distinct overlaps with Mathematics, Further Mathematics and Physics. We welcome thoughts and ideas from students, especially if we can all learn from one another, impart and share knowledge with an emphasis on problem solving applicable across disciplines. All are welcome, regardless of whether they study Computer Science so come along and find out more. On Monday 18th March the Computing Society took a trip to beautiful Jesus College, Cambridge to participate in a lecture by Dr Ulrich Schneider, University Reader in Many-body Physics, and Fellow & Director of Studies, Jesus College. The talk was held at the College’s West Court Lecture Theatre and proved insightful for the students, and gave good background to what quantum computers are versus their counterpart classical computers. These novel machines which fully harness the ‘weirdness’ of quantum mechanics are supposed to soon outperform all classical computers and change the world! What was particularly interesting though, was when Dr Schneider spoke about what quantum computers could open up for us in the future and specifically how RSA encryption could be broken in a matter of seconds versus the thousands of years that is presently required to break encryption. Dr Schneider also spoke about the time that is needed before quantum computers become part of our everyday life, and how perhaps one day they could be incorporated into devices we carry around every day and although that’s not currently possible as the technology has yet to develop – it could quite easily become a reality in the future. After a Q&A with Dr Schneider, we walked into Cambridge city centre where we purchased a meal at a local burger restaurant and our discussions continued - where might quantum computers lead us? What are the realistic prospects of quantum computers? We thank the Cambridge University Science Festival for hosting and running this fascinating lecture, we feel fortunate to have secured tickets and listen to the eye-opening address by Dr Schneider. 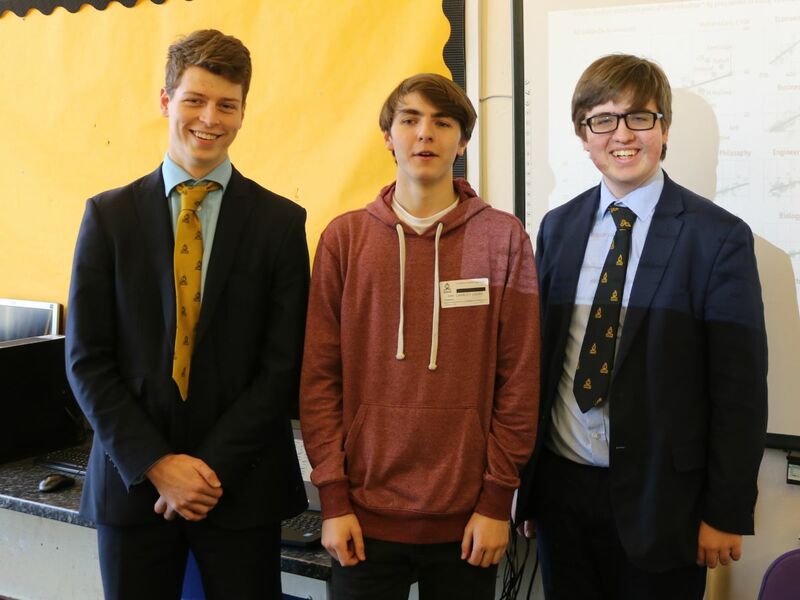 On Tuesday 5th March, the Computing Society welcomed ex-student Charles Lockie back to school after leaving TBSHS in 2018 to study Computing Science with Electronics at Bristol University. The session was well attended by sixth form students, with a number of avid and eager Year 11 students also joining us. Charles spoke about his current university studies, and the type of projects that he’s currently working on. He also spoke about the importance of Computer Science in the future, and how Electronics is key to how Computers are used and built. Charles also talked about his life at university, and the type of clubs and societies he’s currently joined, all of which were insightful into the life of a Computer Science university student. The session ended with a Q&A, with students asking a range of questions from how useful TBSHS was for preparing Charles for university and student life, to his future career prospects as a Computer Science graduate. The Computing Society thanks Charles for the enormous time and trouble he took to return back to school, and we wish him all the best for what we’re sure will be, a very bright future. 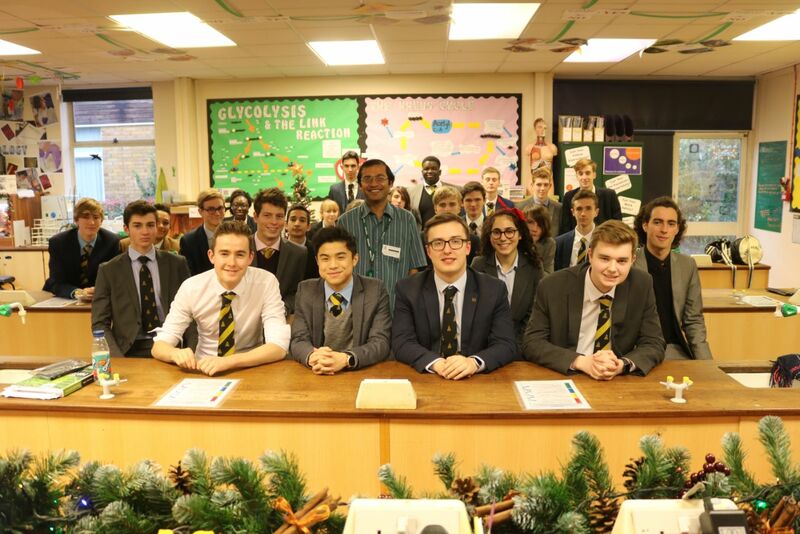 Last Tuesday, the newly-formed TBSHS Computer Society were very privileged and happy to welcome its second guest speaker, Dr Anandha Gopalan, a Senior Teaching Fellow in the Department of Computing at Imperial College, London. The session was extremely well attended by Year 12 & 13 students plus we were very happy to see some keen and enthusiastic Year 11 students there too. Dr Gopalan spoke briefly about the work currently being completed at Imperial College, whilst also speaking about the importance of Computer Science and its impact on us in the future. He also talked about specific topics, in particular cyber security, artificial intelligence and robotics. After his speech, Dr Gopalan opened up the floor to questions from the audience, which proved insightful as students asked a huge range of questions from Is a driverless car driven solely by AI ethical? How will the medical industry change in the future with advances with robotics and AI? Will anti-virus software ever reach a point where it can stop every type of malware? The talk and Q&A session was incredibly interesting and allowed students to grasp some of the work currently being researched at Imperial as well as the research being undertaken within the sector as a whole. The Society thanks Dr Gopalan for taking the time and trouble to travel from London to visit us here at TBSHS and present such a fascinating session – he is a tough act to follow! We wish him every good wish for his research and for the future. 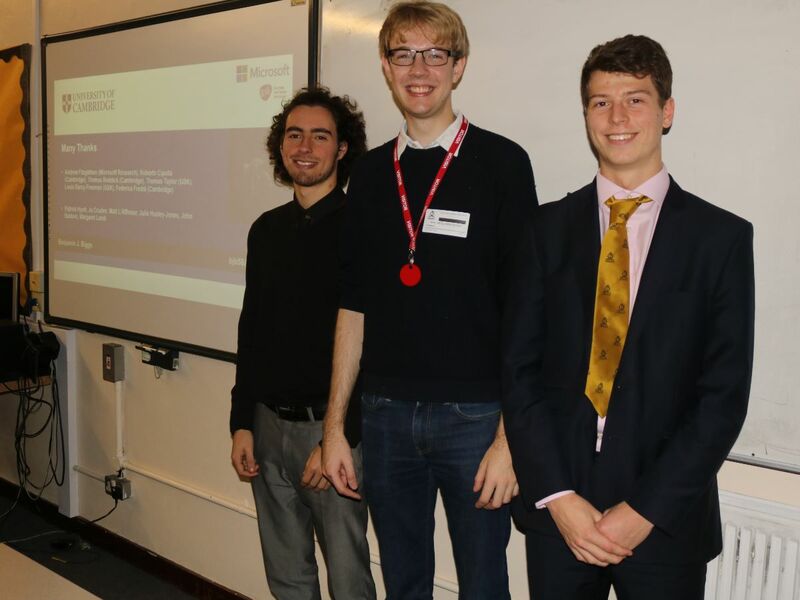 Inaugural speaker, former student Ben Biggs, and presented a session on AI to the Computing Society. We were very pleased to welcome our inaugural speaker, former student Ben Biggs, who visited TBSHS and presented a session to enthusiastic students in the Computing Society. Ben spoke about his work relating to tracking and reconstruction using artificial intelligence, with particular attention towards deriving 3D-shape and pose from animals and humans. 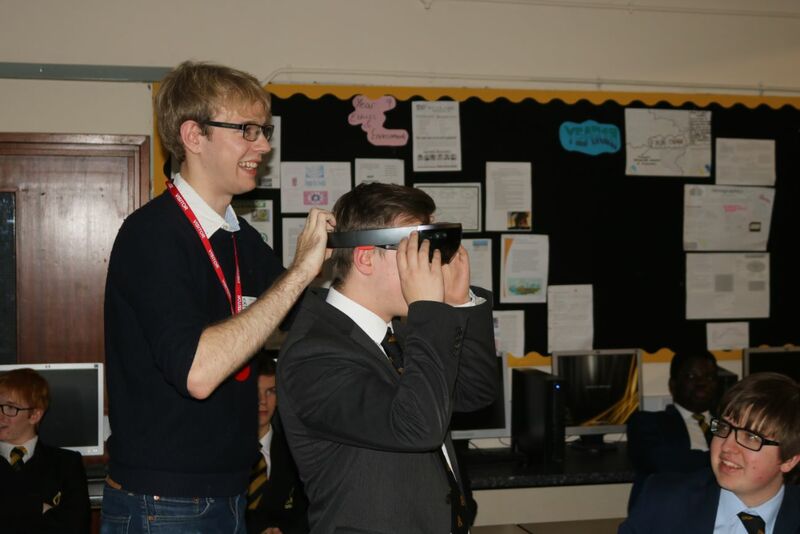 He also showed off the new Microsoft Hololens, allowing some students to experience their first taste of augmented reality, which was an extraordinary experience. The work Ben is doing for Microsoft is incredibly exciting and it will be interesting to see if Ben’s developing projects become a part of every-day life in the future. The Society thanks Ben for his time and trouble, especially as he’s so busy. The presentation worked well as a dry run for the International Computer Vision Conference in Perth, Australia where he flies on Friday. Ben will be addressing 2,000 people at the conference - let’s hope they ask as interesting questions as the Society!